Just a heads-up. Clicking the multiple page indicators on the new posts page does not take you to that page, but to page one -- just the same as if you had clicked the thread title. Thanks for mentioning this -- we are aware of the problem, and our site administrator (Art Roberts, a.k.a. "Forum Support") is trying to resolve the issue. I noticed the same thing with the "First unread post" link not working quite right too. It just takes you to the top of the page. Yes, there does appear to be a problem with the "Page X of X" link. There are other links on there that can be used while while this is being worked on. Just to the right of the "Page X of X" link, both above and below the thread, there are buttons that will allow you to go to specific pages. Just click on the page number you want to go to. There are also "Next" and "Previous" links at the bottom of the thread just above the quick reply box that will take you to the next or previous page in the thread. I've noticed that this has improved. If you click on "page x of x" from the list of new posts, then you do continue to go to just the first page as noted, but once you are there you can click on the individual page links to navigate within that thread. I always encounter this problem when a thread is long enough to have several pages. When I enter a part of the forum, like Altar Tools for example, and click on the small numbers next to the thread title (for example "Protocol for offerings" is 2 pages now and I click on the number 2) it gives a 404 error. Can this be fixed? Yes, this is a known issue that is already being working on. I'm having a problem viewing individual posts that come up after searching on a term. For example, I searched for any posts containing "bipolar" and returned three (the first posted by "sunnyone") within the 73 page "Working With and Disposing of Honey Jars" thread. When I click on any of those posts, I am taken back to the first post on the first page of that thread. Am I doing something wrong? Is there another way to get to these individual posts outside of a painstaking search through 73 pages? My wife and I were just lamenting this last night. I had a quick honey jar question about candle wick piles. I did a search and found 2 posts that piqued my curiosity and seemed to answer my question...alas, clicking on those posts brings you to the first post of the thread...in this case a thread that is 70 pages long!!! Nagasiva, is there a way to fix this?? This is cat, not nagasiva, and i have not yet found a way to solve this problem. The best i know is to notice the DATE of the post i want and then to rummage through the pages looking at the top date on each page until i circle in on the date range and then on the exact date and post i am looking for. I KNOW there is a way to program this into our software, but i am not a developer and although i have asked many times for tech help, i have so far been unable to find a developer who can handle this and the other tech problems we know exist in the software. THANK YOU, Cat! I can't believe I hadn't thought of that! That will make it much easier to find the post actually! Until it gets "fixed" this will do nicely! Thanks again for the help! catherineyronwode wrote: This is cat, not nagasiva, and i have not yet found a way to solve this problem. The best i know is to notice the DATE of the post i want and then to rummage through the pages looking at the top date on each page until i circle in on the date range and then on the exact date and post i am looking for. Oh...darn. What a good idea. I hadn't thought of that either. I just ran into that problem myself. I was searching the honey jar thread -- which is now a whopping 101+ pages long. Eek! Hi, I couldn't find anywhere else to ask this, but I am having problems sending PM's. It says they were sent, but they never leave my outbox and I am not getting replies, and I know they would have replied. If there is anyone that can help me with this I would really appreciate it. Thank you!! babygirl wrote: Hi, I couldn't find anywhere else to ask this, but I am having problems sending PM's. It says they were sent, but they never leave my outbox and I am not getting replies, and I know they would have replied. If there is anyone that can help me with this I would really appreciate it. Thank you!! If a pm is in your outbox it means the person you sent it to has not opened it yet. It was sent,just not read. 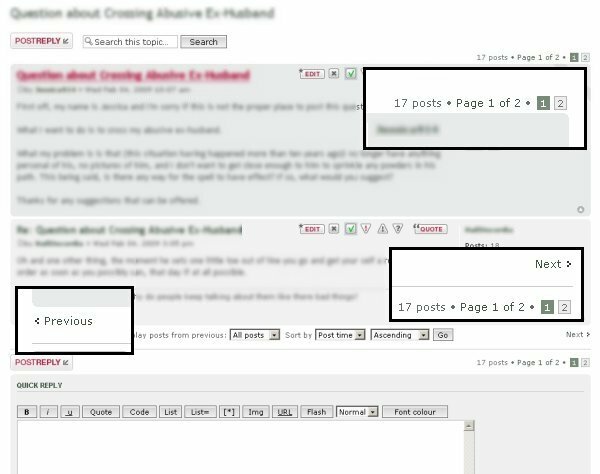 I have noticed something broken in the navigation of the forums. When attempting to go to the most recent page of a large thread, and clicking the "Newest Post" or newest page number links. Instead of going to that newest page, you are taken to page 1, the oldest page. Once here you then try to click on the latest page, but instead only skip about 4 or 5 pages at a time. This makes for hard navigating when doing this in a thread with more than 100 pages. Getting this fixed would be a huge thing for me personally, since I do a lot of time responding to and going to posts in these large threads. I too experience the same technical problems as everyone has voiced on this thread. Plus, clicking on "Jump to Post" or "x of x post" doesn't do anything for me. They still take me back to page 1. If searching for the desired post via Google, it either returns no results, or it does but clicking on the result still brings me back to page 1. It looks like this thread was last active over a year ago. Has anyone since discovered any clever workarounds to this glitch? I'd love to hear it. But, if you find a way to do it, let me know!! !